ABC News has added virtual reality to its news reporting under a new department called ABC News VR. With a smartphone and a VR compatible device, like Google Cardboard or Samsung Gear VR, you can watch Nightline correspondent Alexander Marquardt explore the war-torn capital of Syria, Damascus, in the Inside Syria VR news piece. 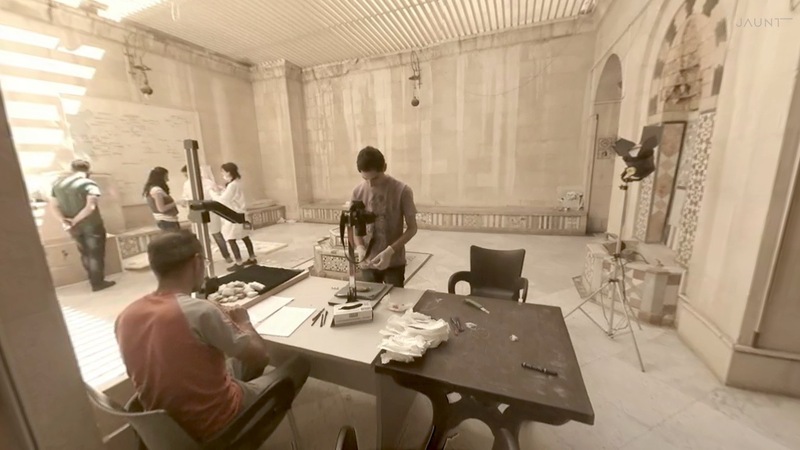 Using a special 360-degree mount with 16 cameras attached, ABC News reported on how city officials are working to preserve historical artifacts that are under threat of being destroyed during the current conflict. Items from such places as the Damascus Citadel, the Souk, the Umayyad Mosque, and the National Museum are catalogued and stored away at a secret location. Images from the cameras are stitched together to create the 360-degree view. ABC News collaborated with virtual reality production company Jaunt VR (an offshoot of Jaunt Studios) to complete the VR effect and ABC plans to use the technology in select international stories in the future. The VR segment, which is available now at ABC's website, can be viewed on desktop computers running Chrome, Firefox, and Safari. However, it is best viewed using a smartphone connected VR headset using the Jaunt VR app available on iOS and Android. The online video is an interactive sidepiece of ABC's Nightline report on Syria. Virtual reality's potential as an empathy machine has already been used to show viewers what it's like to live in the aftermath of an earthquake in Nepal by RYOT News. VRSE's film Clouds Over Sidra showed the conditions in a refugee camp in Jordan and VICE went into the scrum at a NYC protest. Expect more broadcasters to experiment with VR as a method of storytelling.